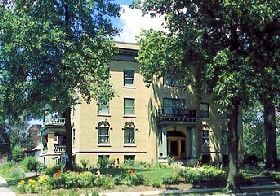 Built in the early 1900s, the Inn at 835 in Springfield, Illinois first housed luxury apartments. The dream of Bell Miller, a turn of the century businesswoman, it was designed during the Arts and Crafts movement by architect, George Helmle. While still in her 20’s, Bell Miller began a floral business in the early 1890’s, catering to Springfield’s high society. Before long, she expanded her small business into a number of greenhouses, encompassing a city block. In December, 1909 her dream home was completed, including airy verandahs, massive fireplaces and exquisite oak detailing in a neighborhood once termed “Aristocracy Hill.” In no time, the dignified building attracted an array of aristocratic tenants who graced the luxury apartments over the years.. In 1994, the building was completely renovated and the apartments were converted into seven luxurious guest rooms, each offering private baths and amenities such as double Jacuzzis and airy verandas. 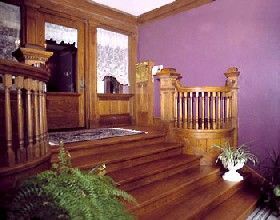 In 1995, the building was placed on the National Register of Historic Places. But according to the legend, Bell Miller became so fond of her dream home, that she refuses to leave. From guests and staff come the stories of a warm friendly voice that seemingly comes out of nowhere. On other occasions, a ghostly figure has been seen drifting through doorways. One report included a book taken from a tightly packed shelf and placed in the middle of the room multiple times. On another occasion, when the wallpaper began to peel away from the wall, it was found to be perfectly repaired the next morning. Apparently, Miss Miller continues to care for her luxurious home. She also seems to have a penchant for candy as the sound of the lid from a crystal candy dish is often heard being removed and replaced when no one is around. Most often reported are the strange events occurring in the elevator. Guests often report that regardless of the button they push, they wind up on a different floor. Though the elevator and been serviced and inspected on multiple occasion with reports that it is in perfect working order, the events continue to occur. In any event, Miss Miller is seemingly a benign and friendly spirit at the Inn, which today provides every modern convenience without detracting from the sense of gracious luxury which Bell Miller created almost a century ago. Today the historic inn provides gourmet breakfasts and evening wine and cheese in its luxurious surroundings. Meeting and banquet facilities are also available for up to 150 guests.